Ukraine's Cabinet of Ministers has approved amendments to the financial plan of state-run enterprise Boryspil International Airport for 2016 in resolution No. 963-r dated December 14, 2016. According to an explanatory note to the resolution, the new plan says that net sales revenue will total UAH 2.923 billion and this is UAH 188.3 million more than it is outlined in the previous plan. It is planned to send UAH 923 million to the national budget and targeted funds, and this is UAH 57.1 million more than in the previous plan. "The decision would help to stabilize the financial state of the state-run enterprise, create proper conditions for bringing passenger and aircraft services to the certain level of quality and create conditions for further development of the enterprise," the document says. Earlier the airport said that the government approved some top priority airport development projects among which is the completion of a multi-level parking area and the increase of wages for the airport's employees. The decision to adjust the financial plan was made by the airport's top managers after the results of H1 2016. The airport's performance figures considerably exceeded the financial target. 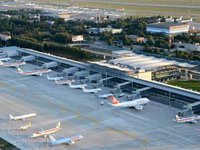 Boryspil seeks to start design works to complete a wing of the multi-level parking area for 1,000 parking lots by the end of the year. Some UAH 100 million will be provided for the implementation of the project. The facility is to be launched by late summer 2017. The Boryspil airport recalled that the issue with returning the funds from Finbank of the construction company that started building the parking area. Despite the court rulings favoring the airport, the Boryspil airport has failed to return the funds. The airport's top managers hope that law enforcement and supervision agencies would help to execute the court rulings. The airport would also increase wages of the airport's employees by 30%. Earlier wages grew by 50% less than in one year. "Important construction works and additional growth of wages will be secured thanks to the company's profit above the target, being over UAH 800 million," the press service said.